The burgeoning industry of biological design is in the headlines every day. Yet even science journalists have had trouble explaining concepts like CRISPR in terms that everyone can understand. A new exhibition at a Silicon Valley museum skillfully explains the technically and ethically complicated field of bio-engineering to adults—as well as the next generation of gene-editors. The BioDesign Studio is probably the only chance a regular human will get to experience what it’s like to be a synthetic biologist for the day. The Tech worked closely with biologists and geneticists from places like NASA, Stanford, Mycoworks, and GenSpace. It was important for the museum and the designers not to dumb down the concepts. In the BioTinkering Lab, for example, visitors can use actual lab equipment to manipulate real samples of e. coli, which is housed in an LED-lit petri dish. In another part of the exhibition, visitors get to play God... or maybe Darwin. 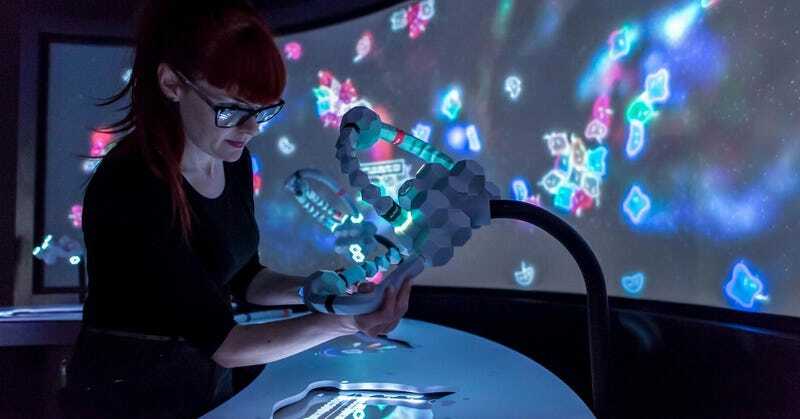 Using a modular system that represents the molecule-building experience—literal building blocks of life—visitors create digital lifeforms, which are then released into the wild world to interact with other people’s creations. Visitors can watch live as natural selection takes its course. But the highlight of the exhibition, which will likely have bio-nerds flocking to the museum, is a room where museum goers can experiment with something called “Turing patterns.” These are algorithms developed by Alan Turing in the 1950s that he believed proved how cellular behavior influenced the appearance of stripes and spots found on animal coats. Visitors control an interface showing a magnified section of an animal’s coat to see how the interaction between the cells manifests in projected visualizations to actual scale. Although the patterns have been fodder for biological theory for decades—read this story on Turing patterns by Gizmodo’s own Jennifer Ouellette—this was the first time they were brought to life in real-time. That’s thanks to the computational power that Turing himself helped develop, said Mika. In a way, that part of the exhibition illustrates why this show is so perfectly suited for its Silicon Valley location: the same machine learning that’s powering our AI neural networks is also powering radical advances in gene-editing technology. AI and biology will collide the most in future years in the field of DIY biology, something that’s also discussed in the show. As gene-editing software like CRISPR becomes more widespread, these tools will almost certainly be making their way into our garages (kitchens? bathrooms? where does one do their at-home gene-tinkering? ).